The Splinter Warband, is an Iron Legion Special Forces Unit. Its members are former Gladiums from various legions, that now work together in a single unit that carries out any and all tasks assigned to it by the Iron legion. Tribune Kindleshot is the IC senior officer at this time(NPC), and it falls under the operational command of the Advanced Warfare Division of the Iron Legion*. *Please note there is no lore to say this division exists, rather its a fictitious NPC command structure to add to the lore and makeup of the warband and its history. Contact is Alexa Splintersteel (DBZVelena.5186) in-game or here on enjin or any member of Splinter in game, although the recruitment process will be conducted by a guild officer. We have and always will be a heavy military themed guild, built around the core concept of an elite military unit. 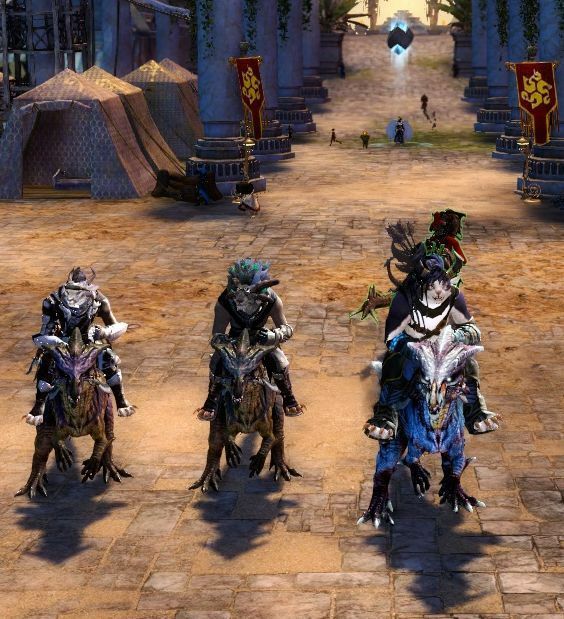 (Think Charr version of the marines). Your character will be expected to be an exemplary soldier at all times, following orders on time and every time. New recruits will be required to go through a period of training to get on par with the rest of the warbands high level of skill. This will be run in conjunction with RP events. On successful completion of this training, your character will be given the rank and designation of specialist and be considered a full member of Splinter. Until then, you will be a recruit also lovingly called a "New Blood". Splinter is a place for you to develop your character and we are very heavy into protocol and procedures. Refrences to the need of completing propper paperwork happen often. Please understand that an inability to follow orders IC, translates into a messy and undisciplined unit that goes against the founding principle of the warband. We prefer quality over quantity! We recommend that you level your character to 80 as soon as possible after joining. The majority of training will be carried out in our Advanced Warfare Center located In Ascalon (This is our guildhall Lost Precipice), or the Irondocks located on the plains of Ashford. We also deploy on regular 4-6 week training exercises and actual combat missions, that often are situated in higher level zones. Want to know more? Read on about the concept behind the guild and what to expect! This warband is a Special Operations Unit, and was set up in 2013 by Legionnaire Trax Splintershield. The warband consists of soldiers who were previously gladium, and in rare cases, those moved by legion command under special instruction. The unit was set up out of a need for the Iron legion to take advantage of emerging technologies and the threat of the Elder Dragons. Initially assigned to work with the Pact forces under the command of the Iron legion, the unit has since evolved along with its role to now work almost exclusively as part of the Iron legion but in a role that benefits all three legions. Early operations seen the warband work with the Vigil, and Priory, as well as several Krewes in Rata Sum in weapons development and testing. After a year of operations the unit extended to encompass 2 more warbands under the names Phase, and Swift. Strike was a warband that was to be added, but was decimated in the battle for Lions Arch while providing a security over-watch for a recon mission. With the three units taking losses it was decided to reunite all three under one banner, and the unit was moved in command structure to the newly formed advanced warfare division under Tribune Kindleshot. Since then the warband has been fighting in all parts of Tyria including spending several months acting in specialist roles for the Pact forces in the Silverwastes, and establishing forward operating bases and rescue operations in the Maguma. Splinter has also spent a significant amount of time and military resources fighting the inquest in a long running campaign called Operation Resolve. Due to heavy losses sustained, and the immense strain of operating for months in hostile environments without normal rotations, it was decided to give Splinter operators a special commendation to move units or stand down due to the level of service provided. Some members moved to new warbands, and some perused their own personal business. Trax Splintershield alongside medic Vita Splintervein, remained but spends most of his time running the advanced warfare school for the legions. Trax Splintershield then attempted to get the warband back on track but a series of mission failures meant that he was removed from his position as Legionnaire. After a temporary assigned aid to get the warband up to its previous level of excellence ended in the mysterious disappearance of this aid. A new Legionnaire was assigned to the warband. Legionnaire Alexa Splintersteel took quick control of the now unruly warband and got the soldiers back on track to once again be the excellent warband it had always been. The warband is funded by the iron legion and has a vast array of resources at its disposal although not unlimited. And at times it can be hard to get certain things funded. Due to the current tactical situation and the overstretched resources of the legions fighting multiple opponents on various front's, the warband finds it has to become resourceful and cunning in how it gets its ordinance at times. The soldiers within come from all of the legions (excluding Flame of course) and have their own special skill sets. The warband is expected to be able to rapidly deploy to any region in Tyria on short notice, and in any terrain. They may be deployed by land, sea or air and each operator is expected to be able to handle any military tasks assigned to them. The units main specialty has always been waterborne insertions into combat zones, and it regularly trains its members in underwater demolitions, and warfare. Members are expected to become part fish! We are looking for Charr roleplayers who are semi heavy into lore, and who would be interested in the development of this concept further. So if your character wants to be the elite of the Charr legions, utilizing the latest weapons and gadgets, alongside working on, and the field testing of equipment, then this warband is for you. Your character should want to be and act like an elite soldier, not some grunt. We offer weekly Roleplay, every monday evening. Members are encouraged to come up with ideas for missions and plot. All members have a voice in the ooc running of the guild and can give their input during the weekly guild meeting. The guild is Roleplay orientated but we do on occasion if enough players want to also attempt guild missions, dungeons, fractals and more. Splinter Warband is a kind of family, where loyalty and connecting to your fellow RP-ers are encouraged. Interested? Fantastic. You should contact me in game with a letter addressed to Alexa SplinterSteel or DBZVelena.5186 or whisper me when I am online. You may also contact any member of our Warband. One of the officers will have an OOC chat to you, and discuss what you know about lore and ask about your character, and give you a chance to ask us questions. Then you can apply to our guilds website. Once accepted your character will be required to undergo an IC test, involving a quick RP session of about 30-40 minutes to get an idea of your character and general rp skills. Here you might meet the officers and find out what its all about. Prepare to have your tail kicked. After the basic tests, there is a medical for your character to do also. You must pass this also to be deemed medically fit for duty. Total run time of this RP session if both are conducted together, is close to two hours. All RP tests are for fun, so don't worry about them. After all that, you get the coveted guild invite and join our Splinter Warband family. Legionnaire Alexa SplinterSteel, Splinter Warband. Last of the needed supplies have been gathered and delivered back to base. Its official, from 22 Jan on, Splinter warband will be in the desert of Elona. Lets hope we manage to get those Skimmers. As you might know, Splinter warband has been in Amnoon for a few weeks now. Soon this will no longer be true. Splinter warband's mission is leading further south and now that the Raptors have been acquired. The warband is preparing its journey south. What they will encounter is not known, but one thing is certain. Splinter warband will not turn back to its home until those Skimmers have been acquired at last! From 26th of February on, Splinter warband will be moving out of Amnoon and south. So fill up your saddlebags for you won't be encountering many bazaars going south. The warband will be soon approaching five years of active service. We are a friendly guild, always looking to promote RP and community spirit. 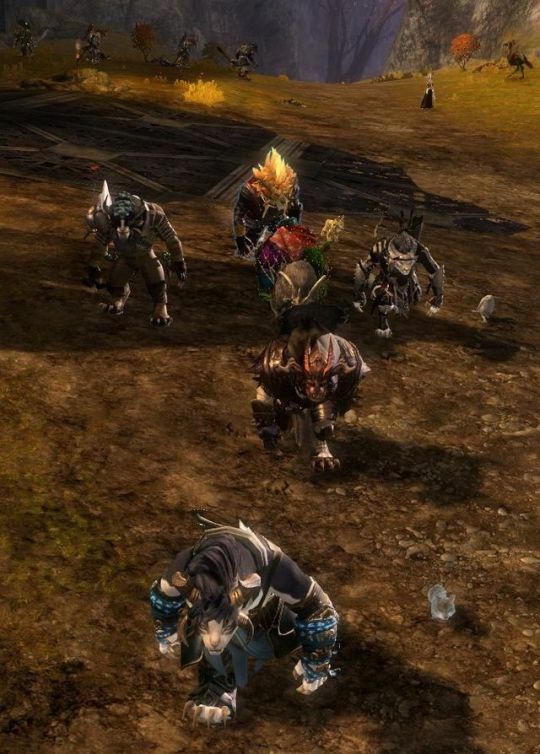 We have had great fun over the past five years with a lot of great RP guilds, so if your looking for something different in your Charr RP and would like to join a tight knit group of friendly guys and gals, that offers a unique experience and a place for you to develop and grow your character, then feel free to give us a call. 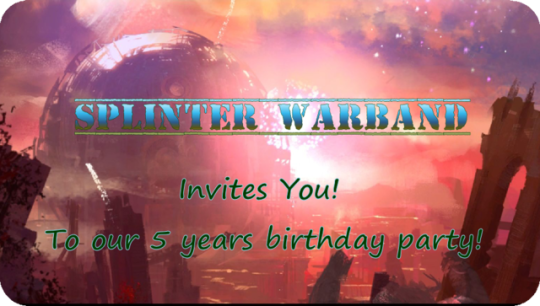 We're having our 5 year birthday party. Summer is over, so Splinter warband will be starting its new plot line October 1st. Just updating that we're currently in our new plot, which is in Orr. Recruitment still open to any charr looking for a warband.